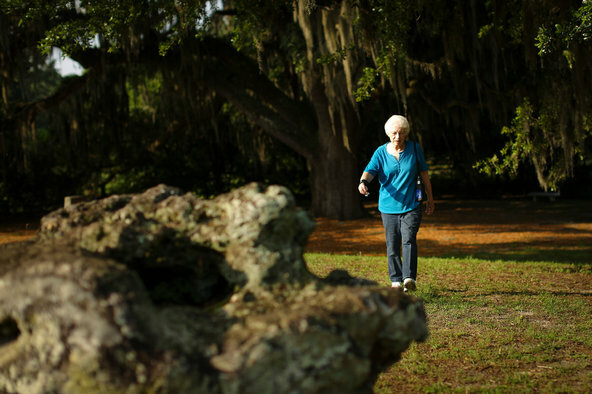 Rob C. Witzel for The New York TimesMildred Johnston walking along a path in Kanapaha Veterans Memorial Park in Gainesville, Fla. Ms. Johnston participated in a large study that showed the benefits of walking for older people. Regular exercise, including walking, significantly reduces the chance that a frail older person will become physically disabled, according to one of the largest and longest-running studies of its kind to date. The results, published on Tuesday in the journal JAMA, reinforce the necessity of frequent physical activity for our aging parents, grandparents and, of course, ourselves. While everyone knows that exercise is a good idea, whatever your age, the hard, scientific evidence about its benefits in the old and infirm has been surprisingly limited. “For the first time, we have directly shown that exercise can effectively lessen or prevent the development of physical disability in a population of extremely vulnerable elderly people,” said Dr. Marco Pahor, the director of the Institute on Aging at the University of Florida in Gainesville and the lead author of the study. Countless epidemiological studies have found a strong correlation between physical activity in advanced age and a longer, healthier life. But such studies can’t prove that exercise improves older people’s health, only that healthy older people exercise. Other small-scale, randomized experiments have persuasively established a causal link between exercise and healthy aging. But the scope of these experiments has generally been narrow, showing, for instance, that older people can improve their muscle strength with weight training or their endurance capacity with walking. So, for this latest study, the Lifestyle Interventions and Independence for Elders, or LIFE, trial, scientists at eight universities and research centers around the country began recruiting volunteers in 2010, using an unusual set of selection criteria. Unlike many exercise studies, which tend to be filled with people in relatively robust health who can easily exercise, this trial used volunteers who were sedentary and infirm, and on the cusp of frailty. Ultimately, they recruited 1,635 sedentary men and women aged 70 to 89 who scored below a nine on a 12-point scale of physical functioning often used to assess older people. Almost half scored an eight or lower, but all were able to walk on their own for 400 meters, or a quarter-mile, the researchers’ cutoff point for being physically disabled. Then the men and women were randomly assigned to either an exercise or an education group. Those in the education assignment were asked to visit the research center once a month or so to learn about nutrition, health care and other topics related to aging. The exercise group received information about aging but also started a program of walking and light, lower-body weight training with ankle weights, going to the research center twice a week for supervised group walks on a track, with the walks growing progressively longer. They were also asked to complete three or four more exercise sessions at home, aiming for a total of 150 minutes of walking and about three 10-minute sessions of weight-training exercises each week. Every six months, researchers checked the physical functioning of all of the volunteers, with particular attention to whether they could still walk 400 meters by themselves. The experiment continued for an average of 2.6 years, which is far longer than most exercise studies. By the end of that time, the exercising volunteers were about 18 percent less likely to have experienced any episode of physical disability during the experiment. They were also about 28 percent less likely to have become persistently, possibly permanently disabled, defined as being unable to walk those 400 meters by themselves. Most of the volunteers “tolerated the exercise program very well,” Dr. Pahor said, but the results did raise some flags. More volunteers in the exercise group wound up hospitalized during the study than did the participants in the education group, possibly because their vital signs were checked far more often, the researchers say. The exercise regimen may also have “unmasked” underlying medical conditions, Dr. Pahor said, although he does not feel that the exercise itself led to hospital stays. A subtler concern involves the surprisingly small difference, in absolute terms, in the number of people who became disabled in the two groups. About 35 percent of those in the education group had a period of physical disability during the study. But so did 30 percent of those in the exercise group. “At first glance, those results are underwhelming,” said Dr. Lewis Lipsitz, a professor of medicine at Harvard Medical School and director of the Institute for Aging Research at Hebrew SeniorLife in Boston, who was not involved with the study. “But then you have to look at the control group, which wasn’t really a control group at all.” That’s because in many cases the participants in the education group began to exercise, study data shows, although they were not asked to do so. “It wouldn’t have been ethical” to keep them from exercise, Dr. Lipsitz continued. But if the scientists in the LIFE study “had been able to use a control group of completely sedentary older people with poor eating habits, the differences between the groups would be much more pronounced,” he said. In the coming months, Dr. Pahor and his colleagues plan to mine their database of results for additional followup, including a cost-benefit analysis. The exercise intervention cost about $1,800 per participant per year, Dr. Pahor said, including reimbursement for travel to the research centers. But that figure is “considerably less” than the cost of full-time nursing care after someone becomes physically disabled, he said. He and his colleagues hope that the study prompts Medicare to begin covering the costs of group exercise programs for older people. Mildred Johnston, 82, a retired office worker in Gainesville who volunteered for the LIFE trial, has kept up weekly walks with two of the other volunteers she met during the study. A version of this article appears in print on 05/28/2014, on page A12 of the NewYork edition with the headline: Exercise for Older Adults Helps Reduce Their Risk Of Disability, Study Says .